National University held on for a 67-61 triumph over Far Eastern University on Wednesday to wrap up another dominant campaign in UAAP women's basketball. It was NU's 80th consecutive win, giving the Lady Bulldogs a sweep of the Season 81 tournament as well as their fifth straight women's title. 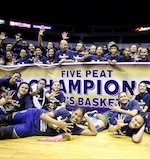 The Lady Bulldogs already own the longest winning streak in the UAAP, and have matched the achievement of the Ateneo Blue Eagles who also won five straight titles from Seasons 71 to 75. Rhena Itesi had 17 points and 10 rebounds, while Jack Animam imposed her will with 15 points, 21 rebounds, and 4 blocks for the Lady Bulldogs. "Sobrang happy lang talaga," said NU coach Patrick Aquino . "Ang goal namin is not the streak. Ang goal namin is to get the fifth championship. Bonus na siguro ang 80 wins and 16-0." Animam added: "Sobrang sarap. I'm on cloud nine." After settling for a slim 18-16 lead in the first quarter, NU pulled away in the second as the Lady Bulldogs outscored the Lady Tamaraws 23-9 for a 41-25 lead at the halftime break. But FEU, making its first finals appearance since Season 77, refused to fold easily. A floater by Valerie Mamaril made it an 8-point game 54-46 with still 9:52 to go in the contest. The Lady Bulldogs simply had an answer for every FEU bucket, however. Jeanne Camelo scored off an Animam dime to respond to Mamaril, touching off an 8-2 run that put NU back on top, 62-47. Three-pointers by Elaisa Adriano and Blanche Bahuyan gave FEU some hope, as the Lady Tamaraws trimmed the deficit to nine points with 2:37 left 62-53. But Animam scored off a putback, then assisted on a transition basket by Kaye Pingol to restore NU's double-digit lead, 67-53, with just 1:40 to play. A three-pointer by Adriano and a lay-up by Clare Castro (193-C-97) was FEU's last chance at a comeback, but the Lady Tamaraws simply ran out of time as NU added another title to its dynasty. Animam earned finals MVP honors after averaging 17.0 points, 16.5 rebounds, 3.5 assists, 3.0 steals, and 3.0 blocks in the two-game title series. Fatima Quiapo led FEU with 15 points, but Castro was limited to just six points though she did have 13 rebounds and four blocks. While NU secured a fifth straight 16-0 season, it finals run was not as dominant as previous years. The Lady Bulldogs won both games by an average margin of nine points, the lowest in their five-year run. "I credit FEU and their coaching staff, their players," said Aquino. "They brought out the best in us. 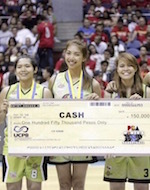 They really prepared well, and hindi naman sila pupunta sa championship if they don't deserve it." "I have to get ready for them next year," he added. "They're gonna be an intact team, so we have to prepare harder." Aquino is losing two players in Ria Nabalan and Jhianne Layug, who both went 80-0 in their collegiate careers. Far Eastern University (FEU) weathered a stirring rally from University of Santo Tomas (UST) for a thrilling 68-66 triumph in the stepladder semifinals of the UAAP Season 81 women's basketball tournament on Wednesday at the Araneta Coliseum. The second-seeded Lady Tamaraws rode a monster effort from Clare Castro (193-C-97), then survived a last-ditch shot from UST's Loraine Capilit in the final 6.3 seconds to hold on for the win. They advanced to the finals of the women's tournament, where they will play the five-peat seeking National University Lady Bulldogs in a best-of-3 series. This is FEU's first finals appearance since Season 77, when they were swept by NU for the first of the Lady Bulldogs' four straight titles. "Hindi namin ine-expect na umabot kami ng finals," a giddy FEU coach Bert Flores said after the game. Castro had 32 points on 12-of-19 shooting, along with 15 rebounds and two blocks. Fatima Quiapo added 12 points for the Lady Tamaraws, who had a 54-37 rebounding edge over the third-seeded Golden Tigresses. UST was coming off a tough 78-69 triumph over Adamson University in the first phase of the stepladder semifinals, and had hoped to beat FEU to force a decider. The Lady Tamaraws were headed for a comfortable triumph after taking a 58-45 lead with 9:07 left, thanks to a three-pointer by Valerie Mamaril. But the Tigresses roared back, thanks to season MVP Grace Irebu and graduating forward Sai Larosa. They anchored a 14-2 run, capped by an Irebu three-pointer, to make it a one-point game with 4:02 to play. After getting a stop, UST had a golden opportunity to take the lead in their next possession, but Irebu bricked an undergoal stab. That touched off a 5-0 FEU run that pushed them ahead, 65-59, with 2:09 left, but a Ruby Portillo bucket and yet another three-pointer from Irebu kept the Tigresses in the game, 66-64. After Quiapo scored a lay-up to make it a four-point game, Larosa drew a foul and calmly knocked down two charities for a 68-66 count with still 51.7 seconds left. The Lady Tamaraws kept the door open for UST with a shot-clock violation, giving the Tigresses 6.3 seconds to work with. But Capilit's bucket was off the mark as time expired, allowing FEU to hold on for the triumph. FEU's Flores now joins De La Salle University's Juno Sauler as coaches who have reached the finals of both the men's and women's tournaments. Irebu finished with 28 points, 13 rebounds, and 3 blocks, while Larosa had 10 points, 8 rebounds, and 5 assissts in her final game for UST. Game 1 of the FEU-NU women's basketball finals is on Saturday at the Mall of Asia Arena. University of Santo Tomas had a cruise of a victory over De La Salle, 79-67, to advance to the Final Four of the UAAP Season 81 women's basketball tournament Wednesday at Smart Araneta Coliseum. The Growling Tigresses chalked up their second win over the Lady Archers in a span of five days, the first on a 68-65 squeaker on Friday that forced the playoff game for the no.4 spot in the standings. Grace Irebu asserted her dominance for the Growling Tigers with 29 points while Sai Larosa and Tin Capalit added 18 and 16 points, respectively. UST will then face another do-or-die game this time against Adamson in the first step-ladder game on Sunday. Defending champion National University already earned a championship round bye after sweeping the eliminations. In the other game, Far Eastern University edged past Adamson University, 67-63, to earn the twice-to-beat bonus in the step-ladder eliminations and will wait for the winner between UST and Adamson. Clare Castro had a 25-point, 16-rebound double-double to lead the Lady Tamaraws while Valerie Mamaril added 14 points, four rebounds, and four assists.